Demand for affordable housing in southern Maine greatly exceeds the available supply, according to Avesta Housing’s affordable housing activity report for the first three quarters of 2017. 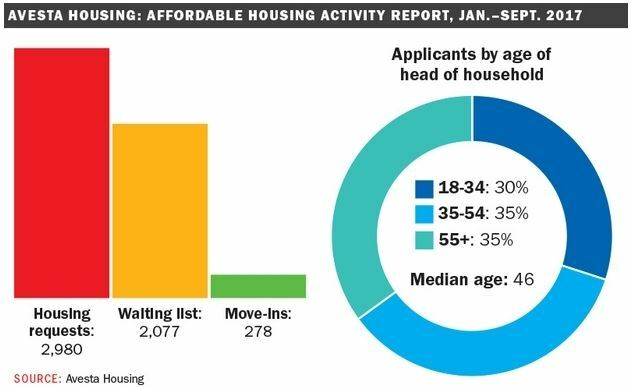 Avesta Housing, a Portland-based nonprofit that has more than 80 properties and 2,400 apartments in its portfolio, reported that 2,077 households were on its waiting list for affordable housing at the end of September. From January through September, 2,980 households sought an affordable home from Avesta, which was only able to help 278 households, or 9% of the requests. Monthly requests for affordable housing that Avesta receives have increased nearly 30% since 2014, Avesta reported in a news release announcing its report.